Think this has been asked before but all the ones ive read have not fixed my issue. Got it the other day and if i open the example or my own and press play in pp is shows on the leds although seems delayed. If I try and save either i get a not enough memory error. I have closed all but the one I want. I've tried this on mac. The strip is not recognized in windows and I have tried reinstall for the drivers but still nothing. mac version is 2.0.3 . Any ideas, guessing im missing something silly. Hmm, can you share the pattern that you are trying to save? I'll take a look here. If it's saying 'out of memory', it might need to be made a little shorter to fit. Out of curiosity, are you using an original length BlinkyTape (60 LEDs), or a longer strip? The supplied image is 600x200px, and is indeed a bit too large to fit in the BlinkyTape memory. As far as I know original. Came in there box. I may be wrong but I thought if I load an image it will scale it to 60 pixels which is what I did. As I was not sure I was doing it correct intruded there example image and got the same error. Have you got a known working image you can send over for me to try. I also found it odd that windows would have nothing to do with it. I am going to try a different pc. The mac can see it. 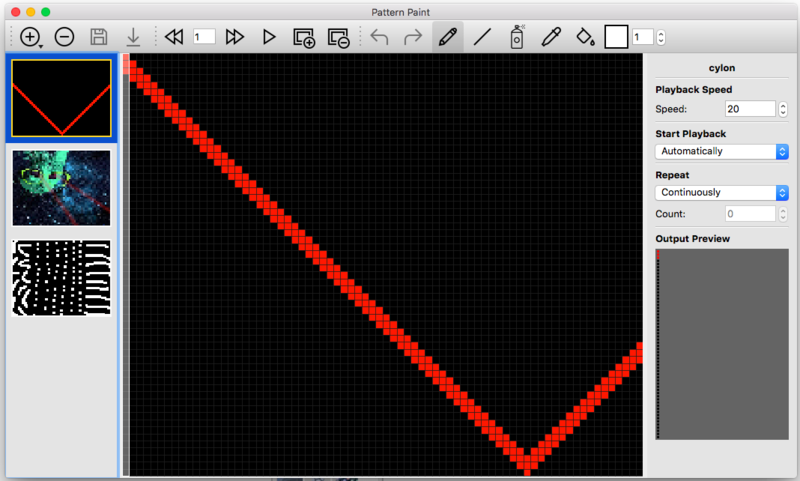 Ok, try this- exit PatternPaint, then restart it. 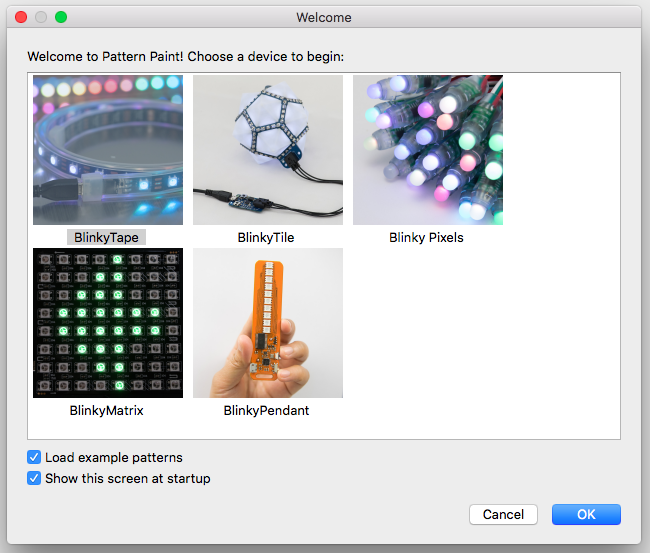 When it starts, it should show a welcome screen- select 'BlinkyTape', and make sure 'Load Example Patterns' near the bottom is also selected. This should result in having 3 patterns loaded, and will also reset the output configuration to a 60 LED long strip. Without loading any more patterns, select 'tools->save to blinky', and let me know what the result is. For the Windows issue- which version are you using? Does PatternPaint run? What procedure was used to re-install the drivers? Windows is pretty finicky about drivers, however we should be able to get it going. Hi Matt, Yes following the above and it let me save them. thats 3 images. I have just made a simple image and trying to save just that i get the memory error again. the image is 60x60. even a new 60x60 with a while line diagonal across it causes the same issue. i must be doing something stupid. ok just noticed, if i open the examples and close the last 2 keeping the cylon and then draw anything on it even like the above image it will let me save it. what are the max image size it can hold? 60 x ?? Hmm- one thing that might help is that it actually tries to save all of the patterns that are open, as a show. You can cycle between them by holding down the small button built into the tape. If there are already multiple images open, it will likely run out of space when another is added.